Today, I went through a local drive through for lunch (shame on me). The lady started off the transaction with something like “Hold on” through the speaker. Then, she came back and said something along the lines of “What can I get ya?” I’m impressed by her total lack of customer service experience. I placed my order and I’m told “613”. No “Please drive around” or anything of that nature. I drive around, handing her $10.15. It crossed my mind to remark about her enthusiasm about working the drive through, but I thought maybe she was just having a bad day. Or, perhaps, a bad life. So, I get my food and my change. Not four one-dollar bills, but five. Yep, five. One too many. I sat in the exit lane debating my situation. I could drive away and put that extra dollar in the offering plate at church. But, as soon as I pulled out of that parking lot, surely I would be rear-ended for stealing. Plus, the girl was already having a hard time. What if her till came up short that evening and she got in trouble? Earlier this morning, a preacher (of all people) was antagonizing me about racism. He was telling me he used to not be racist, but the older he gets, the harder it was not to be. Of the things I said to him (condemning racism), one thing I mentioned is that all we can do is live our lives the correct way, hoping to make an impact on those around us. I hope that $1 made a difference somehow today. Maybe it’s just me being a dreamer. 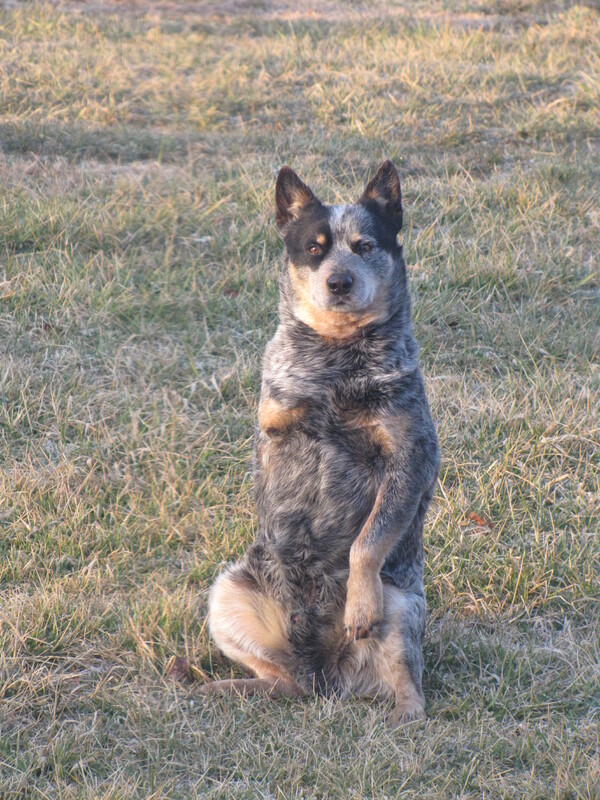 A random, funny picture of our dog, Cujo, pretending to be a prairie dog. See anything missing? When I was little, I loved the taste of Alka Seltzer for some crazy reason. Mom and dad would give them to me when I was sick and I just loved the flavor. One time, I went to my grandma’s house and I was surprised to find she had a huge stash of Alka Seltzers in her bathroom. I put some in my pocket and took them home. When I told my mom that grandma had given me the packets for my upset stomach, she gave me an out and asked me if I was sure that’s what happened. I lied and told her that grandma wanted me to have them. Well, mom then pointed out that they were not Alka Seltzer – in fact, they were Efferdent! I couldn’t read yet, so I didn’t know the difference. That was one of the only two times I ever stole anything. I stole a toy Barbie mirror off a friend one time. When mom found out, she made me take it back and apologize with tears streaming down my face. Broke me from stealing! For some reason, the thought of stealing came to mind this week. My dad brought me some cold medicine pills as my whole house has had the cold this week. I put them in the diaper bag and pulled them out later, which reminded me of the story of my grandma. I’m also reading a book called “The Weird Sisters” and it talks about their adventures with stealing. Once upon a time, in a not too far away land, there was a man who had multiple children and a wife that stayed at home with the kids. Said man did have a full time job, but it wasn’t enough to completely provide for his family’s basic needs like heat and food. I was confused by this man’s choices in life as he had a multiple mobile phone plan, as well as high speed internet and cable television at his house (I’m guessing about $250 per month that could be put toward the essentials). Also, when the tax return came each year, gadget purchases were made instead of filling the oil tank for heat or saving the money for hard times later in the year. Here’s my big question – how are the kids going to turn out? Are they going to learn that this behavior is OK or will they remember their hard upbringing and strive to be different? The only positive thing I can say about the situation is that at least this man is not spending the money on drugs and alcohol. OK, now I’m off my soapbox. On the drive home from the grocery store this evening, I was telling my husband about a thought that I had when looking at the expiration date of my orange juice. The date was March 3, my birthday. I’ve always liked buying food when the expiration date is my birthday, for some crazy reason. But, then I thought, “What if it were MY expiration date?” Wouldn’t it be terrible to die on your birthday? I realized the other day that I’m the receiver of kisses, but I don’t give many. I’m fortunate enough to work with my mom. I had to lifeguard while she taught water aerobics earlier in the week and she gave me a kiss on the cheek. That’s when I noticed that normally I turn my cheek so my parents can give me a smooch, but rarely do I smooch them. Is that the way it normally goes? I kiss my son on the head a lot, but he’s too small to know how to kiss me on the cheek. Speaking of working with my mom…it’s so funny. We have the same travel coffee mug (thanks to my younger sister), and we’ll have the same phone in a few days. We were both wearing the same lifeguard shirts today, too. We already look like sisters without all these exterior similarities. Now, about change. I’m not talking about the kind that makes noise in your pocket, but how life becomes different. My younger sister accepted a job and is moving about 7 hours away. In all the 30 years she’s been alive, we’ve never lived that far away from each other. To this point, we’ve been within a 40 minute drive of one another. I’m very excited that she got this wonderful job just a couple of months after she graduated college. That’s nearly unheard of these days in this job market and economy. I’m really going to miss her, but it will give us an excuse for road trips, huh? I made a change this week as well. I had been helping my old employer part time from home, but I decided it was time to call it quits. My goal in changing jobs a few months back was to have more time with my family, but I noticed that I didn’t have as much time as I had hoped while I was still helping them out. So, change I did and now I’ll have more time to raise my son and enjoy my husband.